As the customary energy resources are depleting and the demand for environment-friendly energy sources are increasing in response to the global warming issues, many countries are stressing the importance of nuclear energy in the competition for securing reliable energy resources. Along with the acceleration in the development of Gen-IV nuclear reactors through international cooperation, massive construction of nuclear power plants has led to worldwide demand for manpower and technology related to nuclear power. Republic of Korea has also exported nuclear power plants to UAE, and a research nuclear reactor to Jordan. However, the nuclear engineering-related research and development of manpower especially, production of internationally competitive and superior master and doctoral students, is very limited compared to the current need and future demands of the nuclear power industry at home and abroad. As the nuclear engineering is highly interdisciplinary, various fields including mechanical, material, electrical, chemical engineering and physics need to be interlaced, so that the competitive nuclear power technology can be secured and maintained. Therefore, for the development of manpower and technology, it is most prudent and efficient to attract talented undergraduates from various academic fields, train and educated them on basics of nuclear power engineering and then further their education in graduate nuclear programs with specialization that meet the current demand and future needs. Therefore, the establishment of graduate programs for the purpose of integrated research, technology development and high-class manpower training in the nuclear power field is seriously required to prepare for the future and smoothly secure the development and supply of nuclear energy at the national level. To meet this requirement, POSTECH has established Division of Advanced Nuclear Engineering (DANE) that will lead to cutting-edge nuclear power-related research and education. 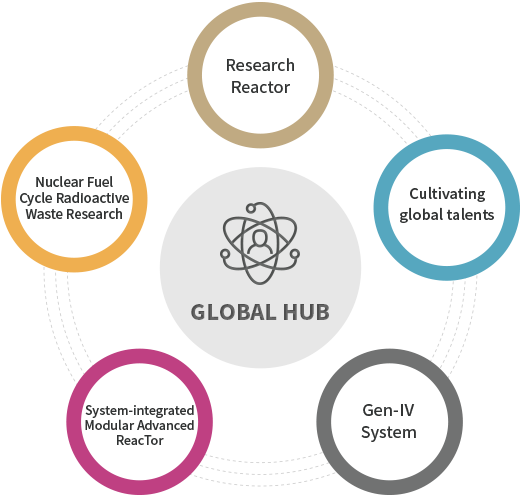 This proposed Institute of Advanced Nuclear Engineering aims to become a global hub for training manpower capable of actively participating in cutting-edge research and development of research reactors, system Integrated Modular advanced Reactor (SMART), Gen-IV systems, nuclear fuel cycle and radioactive waste management technology. To achieve this purpose, POSTECH has selected individuals with superior research and educational output among professors who are active in nuclear engineering-related research from departments of mechanical, advanced materials, chemical engineering, and physics. We have recognized that in order to address the world’s cutting-edge nuclear core technology and to maintain the competitiveness of our nuclear power industry at the world-class level, it is important to include foreign scholars who can perform world-class research through cooperative research programs. The proposed graduate program will integrate several academic fields necessary for nuclear engineering including nuclear reactor physics, neutron transport and shielding, reactor safety, nuclear material, radioactive waste management, and nuclear based hydrogen production, all of which will serve the future of nuclear energy very well. The institute will develop education and research programs that will have the breadth and depth in each topical area, and will bring in a new model of a graduate school leading the development of the domestic and foreign nuclear technology and training of global talent. It is expected that this in turn will support further independent development, construction, operation and export of nuclear plants and contribute to increasing the economic efficiency of the nuclear industry in general.